* Updated 12/3/18! 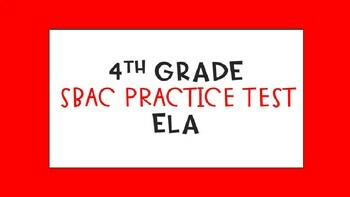 This 43 slide power point goes through questions from the official 4th grade SBAC practice test. 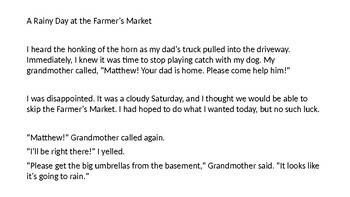 It includes the reading passage, A Rainy Day at the Farmer's market and Coyote Tries to Steal the Honey, along with the corresponding questions and answers. 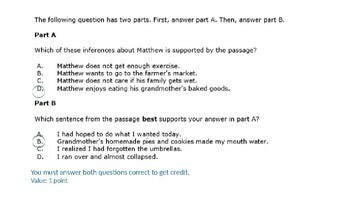 The questions include: multiple choice, multiple answer and a constructive response question. The rubric and sample responses are also provided for each score. The answers for all questions are on separate slides. This lesson works great in a virtual classroom or in a traditional setting. I have found that students understand the format of the test best, when we go over the test whole group. I appreciate your feedback and ratings!